Saturday, March 11, 2017, 9:30 a.m.
Saturday, March 11, 2017, 3:00 p.m.
Join us for an honest and meaningful dialogue about your hopes and concerns as we navigate in a deeply divided country. Discussion topics will include communicating with people you don’t agree with; being influenced by a culture of fear; and finding common ground amid differences. Participants will learn how to use Contemplative Dialogue, a practice of seeing things as they are without bias or filters. They will learn constructive ways to communicate with others for the sake of the common good – without the blaming or defaming, so common in our society today. Guests will come away as better listeners and with a process for seeing the humanity in others, even when you disagree. Sponsored by the Sisters of Mercy, Cranaleith is a nonprofit that offers a contemplative space for all those seeking healing and transformation for themselves and society. For more information go to www.cranaleith.org. 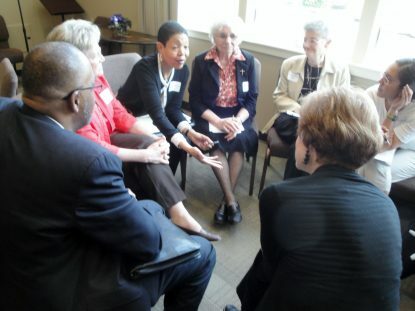 The series, Conversations that Matter, seeks to provide meaningful engagement and dialogue with others toward connection and transformation.